Record Storage Depot and Shred Depot use the latest in records management and document shredding systems and technology to provide our clients with secure records storage, retrieval, confidential document shredding services. Utilizing our modern 40,000 square foot record center, Record Storage Depot provides the latest in records management storage and barcode technology to ensure that your critical business information is stored and can be accessed quickly. 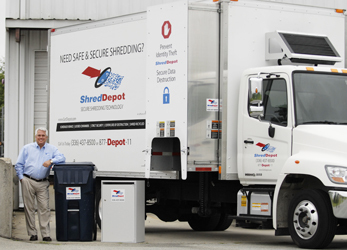 On-site document destruction through Shred Depot and comprehensive records management with Record Storage Depot can meet your unique security and financial needs, no matter the size of your business. Our locally owned and operated companies serve customers throughout the Triad and Triangle regions of North Carolina. Both offer teams of seasoned professionals who have the knowledge and expertise to service your records management and destruction needs.